What is Your Worm Doubling Time? Doubling times can be a little evasive at times. You can do some math about how many cocoons with so many eggs a worm will produce. We can also include the length of time through each part of the life cycle. Most of us will never see the results of such a calculated process because we don't provide the worms with the ideal conditions or the grow room to continue with those conditions. 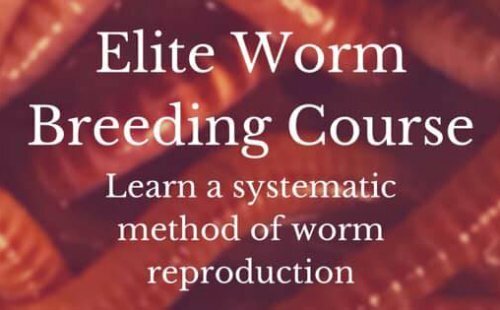 If you start out with nothing but adult worms then one might get a little discouraged at the progress of the growth of worms in the bin. The adults don't grow much and the new cocoons have to mature and hatch before they start to contribute to the visual growth of the worms. I think most of us would rather know the doubling time of the weight of our worms rather than some unattainable calculations. A way to determine mass doubling times(MDT) is to sample a measured area several times to see how much weight has been gained. Once you have used this method a few times you can usually guess fairly close without doing the actual measurements. . To achieve the most even MDT's it is desirable to start with bed run worms. If cocoons are not included then the new bed needs to mature to where new cocoons start to hatch. Otherwise, the measurements will not include the continuous supply of new worms. So, what is your estimated MDT? What worms do you grow? My MDT is about 8 - 12 days with the Worm Tea Factory system and Alabama Jumpers. Comments for What is Your Worm Doubling Time? That's insanely productive! Good for you. I think my EFs are reproducing at the generic rate of around 90 days of doubling or so, but I really don't know for sure. I do know that there seem to be more worms all the time, and it seems that since I quit bugging the poor things every day, they're reproducing faster. Now I only bug them on Worm Wednesdays. I had to designate a day in order to curb my enthusiasm for checking on them for at least 7 days at a time. I also have a very small amount of worms. 1 pound in my kitchen tote (27 gallons), and about 1/4 pound in each of two small plastic totes (18 quarts) under my bathroom sink. I don't feed much kitchen scraps, in order to not have gnats and fruitflies in my apartment (my worms are all inside my apt). So, not sure how their food is affecting their growth. I feed mainly coffee grounds, used coffee filters, some grain flour (varies - rice, pinto bean and oats so far), shredded brown paper bags and paper towel/toilet paper rolls, and occasionally something yummy and gross from the fridge (they're now eating 1/2 rotting avocado). So, I'd say my EFs double every 3 months or so, in these conditions. I was just about to ask the same question. I started out with a mere 100 worms in a 5 gal bucket system and was just about to ask their rate of reproduction so I know when to upgrade or split them up. Join in and write your own page! It's easy to do. How? Simply click here to return to Worm Farming Community.